A sharply defined communication plan can efficiently spread the word about the steps necessary for a successful hospitalwide transition. If your hospital isn’t buzzing with communication about ICD-10 by now, what are you waiting for? Everyone—yes, everyone—should be talking about this monumental change and how it may affect each individual personally within an organization. “The problem is that there are still many facilities where such a streamlined communication structure has not been defined,” says Deepak Sadagopan, general manager of clinical solutions and the provider sector at Edifecs. In some hospitals, communication is so poor that chief financial officers (CFOs) didn’t even know about the proposed ICD-10 delay when it was first announced, says Deborah Grider, CPC, CPC-I, CPC-H, CPC-P, CPMA, CEMC, CPCD, COBGC, CCS-P, CDIP, an AHIMA-approved ICD-10-CMS trainer and senior manager at Blue & Company. How can an organization ensure that the channels of communication are open and working as planned? Experts agree that communication takes a significant amount of planning and dedication. However, the good news is that the ICD-10 delay to 2014 gives organizations an extra year to develop a solid communication plan or refine an already existing one. Either way, the goal is to start talking—and to keep those conversations going. Experts say that every ICD-10 steering committee must include a communication subcommittee charged with keeping everyone informed and on the same page. This subcommittee should oversee a communication strategy that identifies who needs to know what specific information as well as how and when that information will be conveyed. The subcommittee should include representation from senior management, HIM, the revenue cycle, and quality as well as physician and nursing liaisons, says Juliet Santos, MSN, CCRN, FNP-BC, senior director of business centered systems and ICD-10 lead at HIMSS. “One person in particular may not have the expertise to put communications out for everyone,” she says. It’s crucial to involve physician leaders in the communication subcommittee because they are the ones who ideally will in turn convey important details directly to other providers, says Heather Haugen, PhD, vice president of research at The Breakaway Group. Regular communication with physicians helps them understand that the organization has a plan for implementation and that the physicians play a role in that plan, she adds. Without these communications, there tends to be a large gap in terms of physicians understanding their role in ICD-10, Haugen says. The Breakaway Group conducted focus groups during which physician leaders in large hospitals and academic medical centers reiterated that although physicians know that ICD-10 will affect them and their documentation, they don’t understand exactly what will be expected of them. Who Needs to Be in the Know? “Everyone needs to know about ICD-10. It affects just about every aspect of a facility,” says Jacqueline Thelian, CPC, CPC-I, president of Medco Consultants. Key stakeholders (ie, the board of directors, medical director, CFO, and CEO) must be among the first individuals receiving any ICD-10–related communications, Grider says. They should also receive monthly updates outlining the overall ICD-10 budget, expenses incurred to date, and estimated future costs. “I don’t think we’re keeping them as informed as we should be,” Grider says. Initially, everyone in an organization should get the same general message about ICD-10. Emphasize during an initial organizationwide training that a successful ICD-10 transition is crucial to the overall functioning of the organization, Grider says. “The communication piece of this is so important because [ICD-10] relates to the financial health of the organization. If we don’t do this right and if we can’t get paid appropriately, the organization can fail,” she says. Follow up quarterly with organizationwide meetings that discuss accomplishments to date, upcoming goals, and what employees can do to help, she adds. In addition to providing more general organizationwide communications, the communication subcommittee should tailor messages to several important groups within the organization, primarily HIM, IT, quality, finance, the C-suite, and providers. 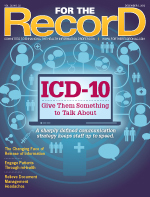 The communication should reflect how ICD-10 will directly affect each group. This includes information about very specific changes in workflow and how those changes will be implemented or addressed, Santos says. For example, when communicating with coders, organizations must clearly articulate their plans to improve documentation on which codes will be assigned, train coders in how to use ICD-10, and potentially maintain dual coding to accommodate the historical data at the early postimplementation phases. Communicating these details will go a long way in terms of alleviating anxiety and preventing turnover, Santos says. Messaging to physicians also must be clear in terms of what’s in it for them individually, not for the industry as a whole, Haugen says. Provide specific examples of how ICD-10 coded data will ultimately help guide the clinical decisions they make, she adds. Give clinicians exactly what they need to know for the type of services they perform, Sadagopan says. Shortlists, index cards, and other job aides that provide physicians a quick glimpse of key points to remember while documenting or responding will be helpful before, during, and after the transition, he notes. The way in which an organization frames the ICD-10 transition is paramount. “I would encourage hospitals to frame it in the most positive way possible,” Santos says. Acknowledge the difficulty of the change but reiterate why the change is necessary. Remind people that by participating in the transition, they are part of a solution that will affect the greater good of healthcare and data reporting, she adds. It may be helpful to align ICD-10 with EHR adoption, Haugen says. “There are some real synergies there,” she notes. For example, both EHRs and ICD-10 require a careful review of clinical note structure as well as rules for clinician decision support. With proper planning, some of these conversations can occur together while many of the key stakeholders are in the same room. Communicating early on can help individual departments plan ahead, Grider says. For example, some software vendors may not be able to transition to ICD-10, and IT professionals need to be able to communicate this information—as well as potential solutions—to everyone who may be affected. “Every department that’s affected by this software program needs to know that you may potentially need to replace [the program],” Grider says. In the scramble to develop an internal communication plan, organizations can’t forget that there are a whole slew of external parties with whom communications must occur. These include vendors, third-party billers, clearinghouses, and outside billers/coders. “Who is keeping on top of [communications] with these people? You shouldn’t just assume that they’re going to be ready. You’ve got to make them part of your communication plan,” Thelian says. Once a communication plan is in place, how do you know whether it’s actually working? Listen to the types of questions that staff members ask during educational sessions, as this information may be indicative of any misconceptions they have about ICD-10 as well as whether your message is getting through, Santos says. Attendance at meetings may be another barometer of whether your strategy is working. Lack of attendance may be one sign that the message isn’t getting through, according to Grider. Consider rescheduling meetings at which attendance is poor and make them mandatory to attend, she adds. When clinicians in particular aren’t engaged and don’t attend meetings, that’s a sign the communication strategy may need some tweaking. Engaging physician leaders can help, Haugen says. Progress also can be measured during steering committee and subcommittee meetings when people are asked to report on their progress (or lack thereof), Thelian says. Oversimplification of the ICD-10 transition also may be a bad sign, Haugen says. “When people start thinking of it as a simple project, I think it’s a sign that it’s not going to achieve the goals you need. People are going to find that it takes a ton of their time for very little benefit,” she says. Ensure there’s a tracking system so that each employee who receives that communication can sign off to indicate they read the material, attended the event, etc, Santos says. Most hospitals can use human resources tracking systems that are already in place for this purpose, she says. Directors and supervisors can help, Grider says. “I think we need to put some of the burden on the directors and supervisors in each department to make sure that their staff members are kept up to date,” she says. Making organizationwide training mandatory may be one solution. Participants can sign in and out to verify attendance and perhaps even take a test to ensure they understood the message, Grider says.